Exclusive Christmas stocking only available from AmysGifts.co.uk. Exclusive Christmas stocking only available from AmysGifts.co.uk. 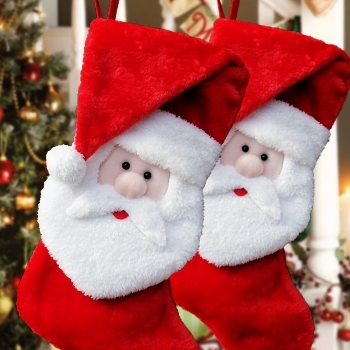 High quality Christmas stocking made from beautiful plush red and white fabric, fully lined with felt inside and has a sturdy hanging loop. Features Santa in his hat on front. This Santa in a hat stocking makes a festive Christmas decoration year after year.